Pope Francis has introduced “a far more open approach to addressing pastoral issues in the church” and “there is huge support among the bishops for what the pope is trying to do,” Cardinal Donald Wuerl told me in this interview for America, hours after the close of the Synod on the Family. Clearly delighted with the approval of all 94 paragraphs of the final document, the cardinal archbishop of Washington looked back over the three-week long synod that brought together 270 synod fathers from 120 countries and all continents. Speaking with me at the North American College in Rome, where he once studied, the cardinal talked about how the synod dynamic developed, the different and sometimes contrasting voices that were heard, the cultural diversity in this global church and how they could all in the end vote in favor of the consensus document, which he had helped write. He also commented on the three important paragraphs regarding Catholics who are divorced and civilly remarried and the synod’s wish for their integration in the church. He spoke about the role of Pope Francis in all this and what direction the church will now take. The synod has concluded its work. Yesterday the synod fathers approved the final document and all 94 paragraphs got the two-thirds majority required. What are your reflections now? Well, looking back over the whole synod and at yesterday particularly, I think the big takeaway from this synod is not so much the discussion about this or that paragraph, this or that point, but Pope Francis’ introduction of a whole wider, far more open approach to addressing pastoral issues in the church. We will not be able to go back a closed version of this after these two synods. The conclusion yesterday said to me, in that aula of bishops from all round the world, there is huge support for what the pope is trying to do, and this opens the discussions in the church to a wider, wider, broader group of church membership and that, I believe, is how he believes that the Holy Spirit will move the church forward. In his speech last night he said, “Many of us have felt the working of the Holy Spirit who is the real protagonist and guide of the synod.” Is that what you felt too? When I was asked about the document, my first response was this is the work of the Spirit. That final document could not have come about just from the writing team. There were 10 people around that table and there were times when I actually could sense that there was more happening in the room than people just passing words around; something was happening and I think it was the gift of the Spirit working to say the mercy of God, the love of God, the pastoral ministry of the church, has to be seen today as integral to the life of the church and that’s what the synod accomplished. This morning in his homily the pope said, “This is the time for mercy,” and I thought it was very significant that he said it. The synod has closed and he has linked it directly to the Year of Mercy. And it makes very good sense, doesn’t it? In that homily he took all the three [Scripture] readings and showed how it’s the mercy of God that’s central. And one of the priests said at the synod in his intervention, the love of the Father when it encounters the human condition becomes the mercy of Christ. I think that we’re seeing this magnificent revelation of God’s love for us, in creating and redeeming us, is alive in the world today precisely because of the mercy of God in his church. I think that’s another takeaway from this synod. The first is the openness—and there’s no going back on that. Secondly, no longer is the framework of the church’s pastoral response the code of canon law. It’s now the church’s understanding of God’s mercy at work in the church’s pastoral and sacramental ministry. That’s a great shift. St. John Paul II once told a close advisor in relation to a serious situation the church was facing: when it’s a question of canon law or the Gospel, you follow the Gospel. That’s the same thing. You know what’s come out of this synod gradually, and in all the discussions—and I think they were very good discussions—once the smog of the idea that this was being manipulated and that there was a sinister plot, once that smog was blown away, and it was blown away in the small circles [language groups] when everybody realized we’re all talking about what we want to talk about, once we got out of the smog and into the fresh air the Spirit began to move. And I think what we saw in the three weeks of the synod was a real reappraisal of, not the teaching—we all affirmed from day one the teaching—but how you share that teaching; how do you get people to stop long enough to listen to it? How do you—as Francis said from the beginning—go out, encounter and accompany? This synod did just that. It’s the first time that I have heard a synod attempt to do that. And you’ve participated in synods many times. 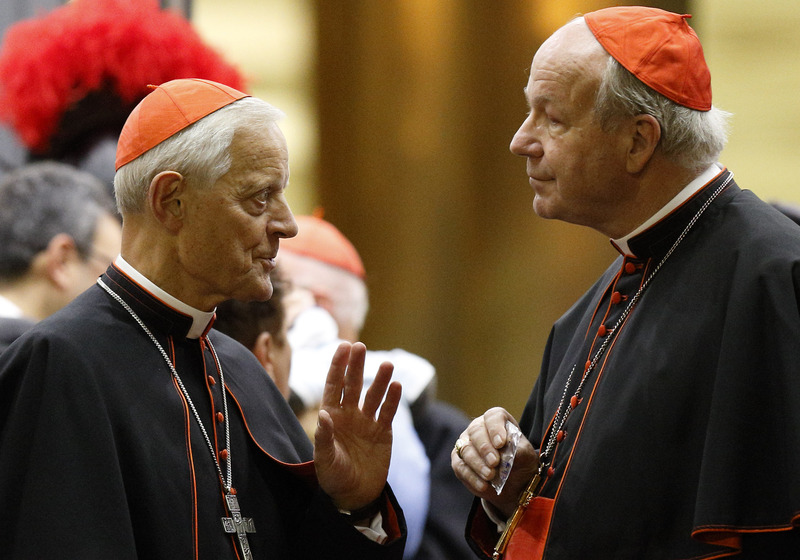 Some see this synod as a turning point, a watershed, in the history of the church. How do you see it? I think it is an opening to a new direction. I think the new direction is in complete continuity with the Second Vatican Council. It’s just taken 50 years, good years in between where there was, sometimes, a lot of upheaval and then the consolidation of John Paul II. We wouldn’t be here today if it were not for John Paul II. But now we’re at a point where the openness that the council asked for, taking the Gospel in all of its integrity, in all of its truth and trying to find how does it actually reach and touch and change the world today. I think that’s where we are but in a whole new mode. Pope Francis has said you can’t sit behind closed doors and do that. Yes, and that was I think the genius of connecting the two synods to say it’s ongoing. You can’t come together in two weeks’ time, in three weeks’ time, and arrive at pastoral decisions that truly impact the world. But if you start talking about it, and invite the larger church into it as he did from before the first synod, through all the consultations, the episcopal consultations, then you’re on the road. Pope Francis basically said we need to discuss these matters openly and in the light of the Holy Spirit. I don’t think we can go back on that in the future. It’s very interesting that in his speech last night at the end of the synod, the pope said, “What seems normal for a bishop in one continent is considered strange and almost scandalous for a bishop from another.” That is something that was evident in the synod. I think that what we learned in the synod in dealing with human sexuality, marriage and family was that around the world all that’s lived and experienced differently, culturally. The church hasn’t changed her teaching on any of that, but the challenge to even have that teaching get a hearing varies greatly. In our small circle [language group], I so much appreciated hearing from people from India, from Africa and one from a country that was previously behind what was called the Iron Curtain, and then from all of us from the Western world. I think you’ll note that this final document is not seen only in the framework of the Western world. When you look through those paragraphs it’s no longer a Western world speaking on behalf of the whole church. That’s also a huge difference. As you said earlier, it’s taken the church almost 50 years to reach this point. As you look to the future, what do you see? Well, remember the church always, just given the size of it and the importance of the message, moves very, very slowly. One of the reasons it took 50 years to get here was because of all the confusion and upheaval in the late 60s and 70s. And it took the entire pontificate of John Paul II to begin to rightly order things. Once again to provide stability to the church based on the Council. Now we’re in a position to move forward. I suspect we’re going to run into a number of currents, and it’s going to be up to the leadership in the church, now working in a very different way, working with the whole body of the church, to steer clear of exaggerations. By this you mean people, priests and bishops, working all together? Yes, the bishops exercising their responsibility, but as pastors of a church made up of the faithful—the rest of the faithful. That’s what Pope Francis asked these two synods to do, which is what they did. The voices heard at the synod just concluded reflected the consultation round the world. That’s going to be a part of going into the future. But I think we have to be cautious that moving into the future we don’t take every suggestion and say this now has to be done. We can take every suggestion and say let’s consider it. Obviously the question that now many people ask after they saw that the real battle in the synod last night was around the three paragraphs [Nos. 84, 85 and 86] in the final document regarding the divorced and remarried. You were in the commission drafting the final document. How did you manage to arrive at a text that could actually garner the approval of two-thirds of the synod? The norm was whatever we present has to be balanced. Remember the Holy Father told us that he wanted that whatever we produced to truly reflect what was heard in the [synod] hall. That was when he came in and spoke to the commission. He said this document has to be a consensus document; and a consensus document has to reflect what the majority of people in the hall were saying. And so we made that the touchstone: to say whatever we produce the majority of bishops in the hall have to be able to say, “you know that sounds like what we heard, that sounds like what we said.” And when we came to these neuralgic issues—I have to tell you I kept using that word until one of the other fathers said to me, “Why don’t we just use the word ‘difficile’ (difficult) not ‘neuralgici,’” so I started using the word ‘difficile’—when we came to the difficult points we said it has to be balanced, because you heard great balance in the synod hall, you heard people speaking from a variety of positions. You also heard apocalyptic declarations. Yes, but they did not represent the consensus in the hall. Yes, they didn’t represent the consensus in the room. So that’s what we tried to do [to write a consensus document] and I think that our brother bishops in the hall recognized that. The three major Italian newspapers today lead with the same banner headline on their front pages: the synod reaches agreement on opening to the divorced and remarried. The synod’s final document says people who are divorced and remarried are still members of the family, they are still our brothers and sisters and so we want to make sure that they don’t feel excluded from the church, but it doesn’t say therefore this and this and this must happen. It’s the “therefore” that we will be talking about going into the future. I imagine the pope will write something about this, since you asked him to do so in the final document. That was the last paragraph. By the way we introduced that last paragraph because there were people saying, “What’s going to come out of this?” So we said, why don’t we ask the pope to produce something on this? This is really perplexing for me. I don’t know if he will do a document, a post-synodal apostolic exhortation, or whether he will use this, different sections of it, to have further reflection on, or to give some series of conferences, homilies, Wednesday audience talks on one or other aspect of it, and help it develop. I really don’t know. Do you think he could write an encyclical? He could easily write an encyclical based on all of this. I just don’t know. What are you taking back from the synod for the American church? What I want to take back, and what I’ve already started to put together, is the recognition, first of all, that it was a successful synod. We set out to talk about family, and for three weeks the whole world was talking about the Catholic Church. I’ve never seen so many journalists come to report on a synod. Yes. So we succeeded in focusing on the family. We also succeeded, I believe, and this is something all in the church have to work on, we succeeded in realizing, recognizing that we need to focus a lot more energy on our families and on strengthening for the next generation the concept of family and marriage. Having said that, we also said you just can’t say that every pastoral issue is closed. There has to be in the church more ongoing reflection and discussion. I think that is also a very good thing. So I will be saying to the church in the United States—I get back to my archdiocese tomorrow—I hope to be able to say this synod was a success because it brought our attention to marriage and family. It was a success because you can see the work of the Spirit in those final 94 paragraphs. And third, the synod was a call of the Spirit to say we have to be far more embracing, the outreach of the church even to her own members has to be far more embracing. I would also like to remind everyone to pray for our Holy Father. Yes, everyone recognizes that without Pope Francis this kind of synod wouldn’t have happened. His closing talk, I thought, spoke to his sanctity. He gave this beautifully serene, compassionate talk, pointing out facts and being open, even referring to conspiracy theories, but at no time condemning anybody, just saying let’s move on now and keep moving forward. I think that’s why people love him. He speaks the truth, but he really does it in love. As a simple lay person, I do not have a theology background, but have experience in Marriage and Divorce. My wife left our 3 children and myself going on 7 years ago after she met a married man who simultaneously left his wife and children. Both my wife and this man "married" in a Protestant ceremony and now have 1 child together. My wife wanted to remain Catholic but since she could not receive Holy Communion, she left for a Protestant church. To this day, I have physical custody of our 3 children. My wife and I are civilly divorced. IF, as of now I do not plan to, but IF one day I seek an annulment, and IF an annulment is granted, only then can I even begin to think about dating. If the annulment is not granted, then I would honor my marriage vows and not date nor remarry. The pain that my wife's infidelity caused on our 3 children as well as my own pain was significant. Thanks be to God, 7 years later, we are doing well, thanks in no small part to the grace given to us through our Lord Jesus Christ, prayer, family, friends, and certainly a priest friend of mine whom guided me during the pain of infidelity. My point is, IF the Church has true mercy, then the message of mercy should be one that leads to one's soul to salvation. If that means for divorced and remarried to obtain an annulment, then so be it. If it means that an adulterous relationship must end in order to begin the process of receiving Holy Communion, and giving their valid matrimony a chance at reconciliation, so be it. I believe that my road to Heaven is through my wife and vice versa. Does Holy Mother Church still teach this? How would have the Church of Cardinal Kasper have dealt with King Henry VIII? I've been following the Synod closely, hoping to find spiritual direction in regard to my current situation of undesired civil divorce--without remarriage. My 22 year marriage with 4 children ended suddenly and unexpectedly when my husband moved out. I gradually learned that he was having an affair with a co-worker, and they eventually got married. Prior to their marriage, he petitioned the Church for an annulment. I was very upset by the process, which is demanding of time and energy. I felt it added trauma to my already traumatic situation. It was confirmed that our marriage was valid, which has given me some solace. However, our marriage is now (obviously) irreparably damaged, and I'm in a kind of limbo. Though I've certainly been supported by some friends, both religious and secular, I've also been stunned by the lack of response and support to my broken situation by the Church and by my community. I am troubled by the idea of his new marriage, celebrated by an Episcopal minister (his cousin), gaining any sort of "approval' from the Church. Surely there will be some focus on those left holding the pieces? As the husband with children who was left behind, I echo your concerns. I feel that the Synod did not acknowledge those spouses who as you say are, "left holding the pieces". At times it seems The Church has forgotten about supernatural faith. Certainly many German bishops have said as much. Instead of asking laity to pick up our crosses, the message that seems to be leaking out from some quarters is one of seeking a "personal" relationship with Jesus Christ....which to me reeks of Protestantism. Thanks for your response, Ben. Can you explain what you mean by supernatural faith? My (ex)husband is seen, even now, as a morally upstanding Catholic. Before leaving, he apparently discussed our marriage with several people, but not with me. It appears that no one with whom he confided--his family and several 'friends'--attempted to dissuade him from leaving, and no one informed me. He secretly had "counseling" with a priest and told me that he had been advised to leave the marriage. In addition, he did not seem to have any societal consequences for abandoning his marriage. One of the hardest pills for me to swallow is that he works at a Catholic Institution and the woman he married is still working as his subordinate there--though I cannot know if some special arrangement has been made with HR to avoid the appearance of impropriety. It seems we live in a society, currently even within our own church, were it is perfectly acceptable to leave your marriage and no one will "judge." What can the Church do to prevent this? Surely more than it is currently doing.